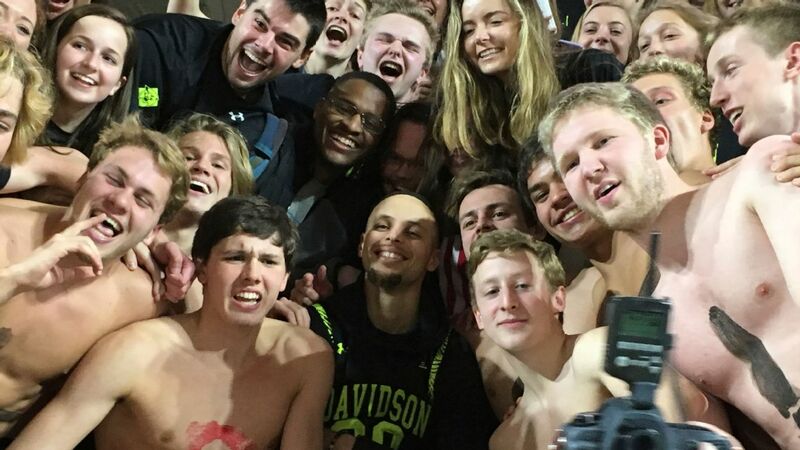 DAVIDSON, N.C. -- Golden State Warriors superstar Stephen Curry celebrated Davidson's 80-72 home victory over Saint Joseph's on Friday night by jumping into the student section at his alma mater as a sellout crowd screamed its approval. Curry, in town for NBA All-Star Weekend in nearby Charlotte, sat courtside throughout the game and watched as the Wildcats erased a seven-point halftime deficit to maintain their undefeated record at John M. Belk Arena this season. What made the night unique for Curry is that the Wildcats were dressed in specially designed black Under Armour uniforms and shoes from the SC30 line he fronts. Curry proudly wore a black No. 30 jersey, his number in college, over his hoodie. "It's surreal, even to this day," Curry said before the game, while discussing what it's like to see his former team wear his logo. "I know I accomplished a lot, but it still doesn't quite sink in. The opportunities that I get to experience now, a program that meant so much to me that gave me my entire, just, basketball and base and foundation and how much I've learned from Coach [Bob] McKillop and my teammates and stuff like that when I was on campus. I always look forward to going back and watching them play and being a part of the program any way I can. "In terms of just helping them with gear and representing me and the school as well, it's just wild to think about. And I'm just happy to be a part of it." Curry, who rose to national prominence in 2008 while carrying the Wildcats to the Elite Eight in the NCAA tournament, received loud cheers throughout the night and was clearly enjoying himself. In the second half, he was shown on the video board joining the crowd in singing "Sweet Caroline." The highlight for many in attendance came after the game ended as Curry jogged from his courtside seat and climbed into the student section while being mobbed by young fans. After a couple of minutes, Curry climbed back to the floor and stayed for a while, signing autographs for fans and former teammates. One of the fans Curry was able to spend a few moments with was former Cy Young Award winner Frank Viola, whose daughter, Kaley, is an assistant volleyball coach at Davidson. Curry was serenaded with chants of "MVP! MVP!" as fans pleaded for a second of his time. Curry -- taken No. 7 overall by the Warriors in the 2009 NBA draft -- maintains a strong relationship with McKillop and many Davidson alumni. "Steph's fingerprints are all over our program," McKillop said in a recent phone conversation. "He is very cognizant of the fact he went to Davidson, very grateful for that experience. And makes it an effort to put us front and center in all he does and include us in all he does. And that's kind of rare." As Curry celebrates the memories of his famous run through the NCAA tournament, he does so with an undying affinity for where he came from and what he represents for Davidson. "It's always fun," Curry said in a recent interview of being back on campus. "I'm getting old now, older, in terms of 10 years removed [from school]. I try to stay as in tune with the team as possible, but there's so many new guys -- they know about our '08 team and not much has changed in terms of how Coach McKillop approaches it. Same stuff he was telling us, he was telling them, so there's always a bond. "When I go back for sure I know there's a lot of alumni and ex-teammates that are going to be there, and again that's just a way to celebrate such a small community that made such a big splash on the college scene for sure." 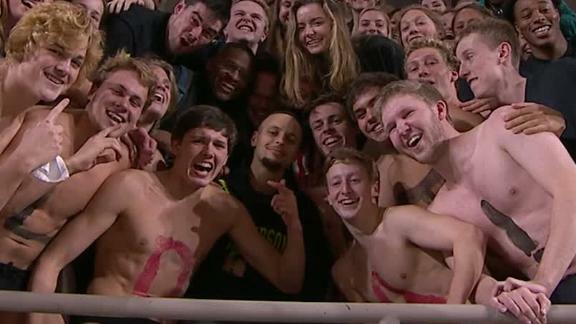 Steph Curry celebrates in the Davidson student section after its 80-72 win against Saint Joseph's.